Believe it or not, it has actually been raining all week here in Dallas. It might still be summer (and of course, hot) but the rainy grey sky put me in the mood for something comforting and cozy. There was this “Kentucky Bourbon Bundt Cake” recipe in one of my favorite baking books, [easyazon_link asin=”1607741024″ locale=”US” new_window=”default” tag=”sugbut02-20″]Vintage Cakes by Julie Richardson[/easyazon_link], that I’ve been wanting to make. I love buttermilk bundt cakes, so buttermilk bundt cake with bourbon? Perfect! 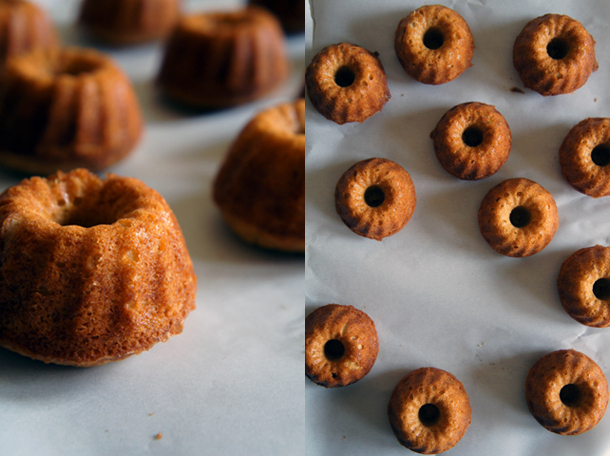 I just made a few small changes, switched the glaze and the result were these moist little Bourbon Bundt Cakes. You can really taste the Bourbon and the flavor is just full and – well, comforting. If you want to make one large bundt cake, just double the ingredients! 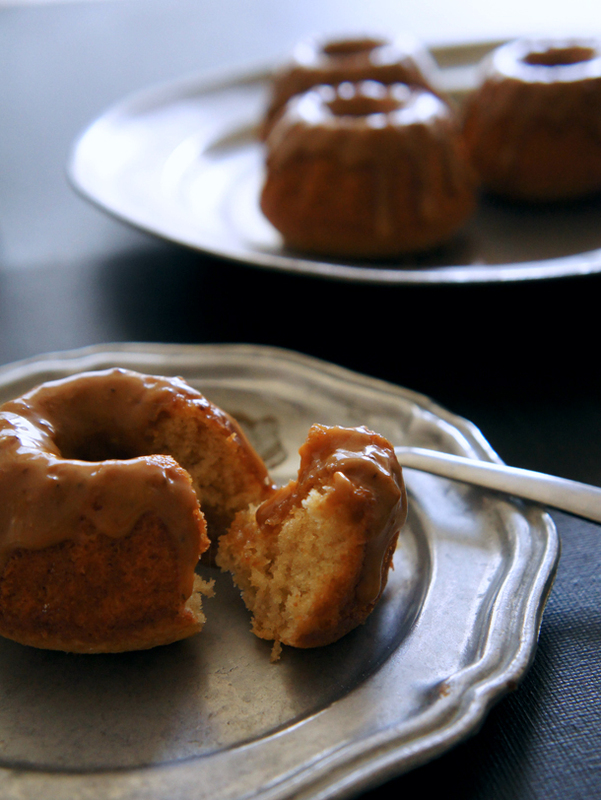 Buttermilk cake meets whiskey: These mini Bourbon Bundt Cakes with Brown Sugar Glaze will melt in your mouth and comfort you not just on cold days! Preheat your oven to 350°F / 180°C and grease a Mini Bundt Pan. I use this 12 cavity pan by Wilton, it's the most affordable out there and makes muffin-sized little cakes. To make the cake, sift together the flour, baking powder, soda, and salt in a bowl, then whisk the mixture by hand to ensure that the ingredients are well combined. In the bowl of a stand mixer fitted with the paddle attachment, cream the butter and both sugars together on medium-high speed until fluffy, about 5 minutes. As you make the batter, stop the mixer frequently and scrape the paddle and the sides of the bowl. Combine the bourbon and buttermilk in a small bowl. With the mixer on low speed, add the flour mixture in 3 parts, alternating with the buttermilk-bourbon mixture in 3 parts. Make sure not to mix the batter for too long in order to not overmix it, and keep your mixer on low speed. Stop the mixer right after you added the last batch of ingredients and complete the blending by hand with a rubber spatula. Pour the batter evenly into the prepared pan. You might have a little bit left-over batter, just fill it into a muffin pan or another small cake pan. Place the bundt cake pan in the oven and bake until the cake is golden 20-25 minutes. To make the glaze, melt 2 tablespoons butter with ¼ cup light brown sugar in a small saucepan over medium heat. Bring to a boil, then add about 2 tablespoons of bourbon and bring back to a boil. Pour the hot mixture into a bowl. While still hot, sift in the powdered sugar and immediately start dunking the cakes into the frosting. The frosting should set almost immediately. Bourbon? Brown sugar? SOLD! Beautiful styling and photographs too! Danke! genau sowas hab ich gesucht. wird ausprobiert! na da bin ich ja froh 😉 sind total lecker!